2,670 of 11,480 (23%) Birds in Backyards members completed the survey, 2,666 were valid responses (resident in Australia). 513 members of the general public completed the survey, 504 were valid responses. 33% of the general public surveyed said that they were highly concerned about declines in some native bird populations in Australia, and 53% said that the diversity of native urban birdlife in Australia is decreasing. This compares with figures of 78% and 72% for BIBY members respectively. 38% of the general public surveyed said that their personal wellbeing was highly dependent on the wellbeing of the natural world, compared with 74% of BIBY members. 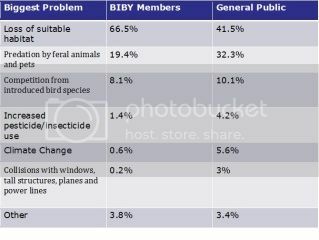 60% of the general public surveyed and 78% of the BIBY members surveyed felt that individuals were responsible for preserving native urban bird diversity, followed by 65% and 73% for local council, 55% and 70% for state government, 53% and 68% for federal government, 36% and 51% for not-for-profit organisations, and 32% and 50% for corporations and large businesses. 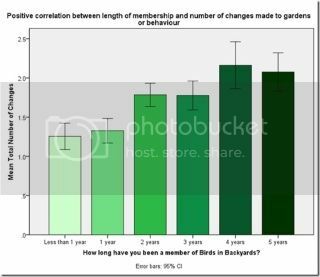 66% of BIBY members had made at least one change to their garden or behaviour to help birds, as a result of being involved in Birds in Backyards. The average number of changes increased with the length of membership (see Figure 1). The most popular changes were: Increased native plants (41%), Installed a bird bath (32%), and Increased density of vegetation (29%). The main reason for joining Birds in Backyards was to be able to identify birds, photographs and bird calls were reported as particularly valuable. 43% of members said Birds in Backyards had helped them to address the decline of birds in their backyards. 80% said that by submitting a bird survey, they felt they had contributed to the effort of studying and protecting birds. 85% think that one of the main benefits of Birds in Backyards, is discovering that learning about birds is fun! This project has gathered a large amount of information on the members of Birds in Backyards and how they utilise its resources. Birds in Backyards members in general are highly educated, are self-employed or retired/semi-retired, own their own homes, and are involved in native species conservation. Almost ten per cent of members had completed “formal study of animals/nature”, versus only 1.5% of the general public surveyed. Many members have a strong interest in native gardening and habitat creation which is just as important to them as their interest in birds. Birds in Backyards members use the site in a variety of ways, with some having an interest in native gardening that is complimented by an interest in birds, some being experienced birdwatchers while others are complete beginners, and some who are avid bird lovers and conservationists. Some members simply visit the site occasionally to identify a bird or check up on the latest backyard bird-related news. Birds in Backyards is also used by some environmental educators as an information resource for professional purposes, as well as a tool for educating co-workers and engaging the general public in habitat creation. 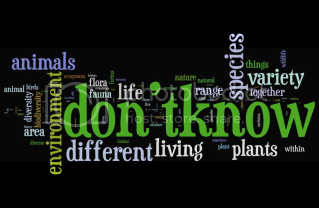 The general public (non-members) also showed a reasonable level of interest in bird conservation and a high level of concern about declines in native urban bird diversity. 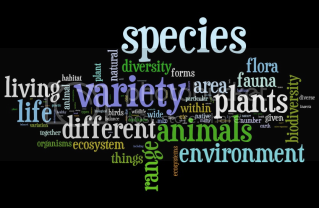 Although the level of scientific knowledge as measured by our survey was lower than that of our members, it was still higher than was expected by the project team, and the understanding of the term biodiversity in particular was good in those that correctly defined it. Birds in Backyards intends to use the valuable insight gained from this research to inform future activities. For example, in future evaluation will be built into the program, in order to assess the change in member attitudes, knowledge and behaviour that has occurred as a result of participating in the Birds in Backyards program. The program is currently working towards a strategic national expansion. The results of this research will assist the Birds in Backyards team in targeting information to various demographics, and has provided information on the necessary resources and support required to work more closely with local governments across Australia.